Get Started! Choose desired musical clef: treble or bass. You can easily switch from treble to bass or bass to treble with one simple swipe! Identify the correct note by touching A B C D E F G button and advance to the next note. Already know the note? No problem! Double tap on note to skip to the next note. Master level 1 and proceed to the next level until all 4 levels have been mastered. Each correct note scores a point. Blue Note software also recognizes missed or incorrect notes and will repeat these notes until they have been mastered. Users can manually change levels, with a touch of the screen, and save score and level upon exit as well! 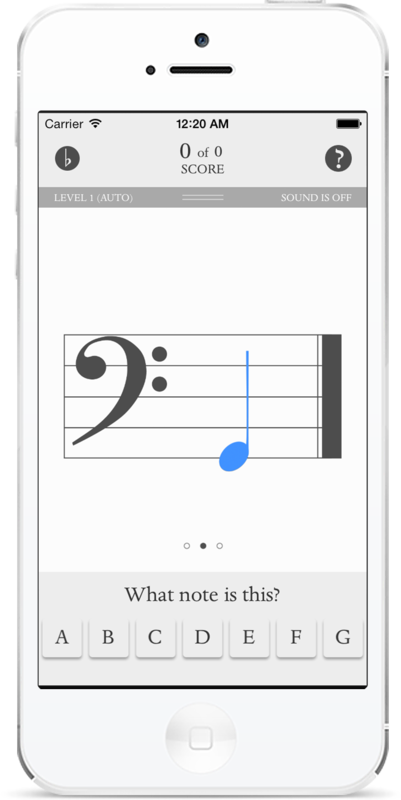 Blue Note was designed with the help of a former elementary school teacher to effectively teach musical notes.